Update of July 2018: scroll down to the comments where a reader has identified Hattie as Harriet Newell Weston, born in 1862 in Winthrop, Maine, daughter of Simeon Weston and Lavina (Blanchard) Weston. 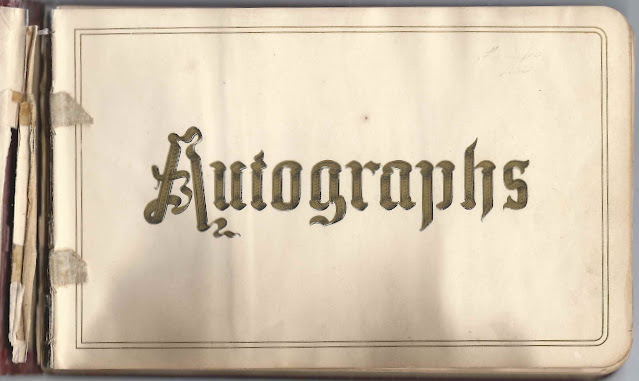 1885-1898 autograph album that belonged to a Hattie, presumably of Kennebec County, Maine, in the Readfield, Maine area. The only clue to the album owner's name is the sentiment left by Ida M. Sanborn of Vienna, Maine, on July 16, 1887. 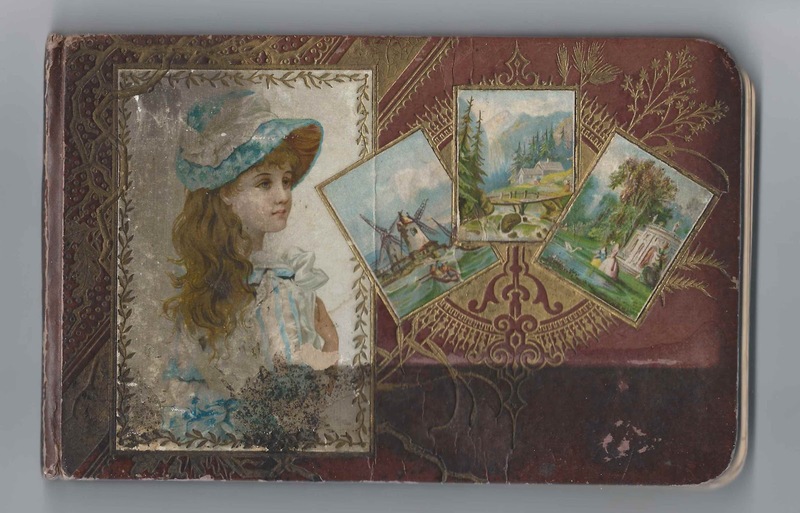 The album is approximately 7-3/4" x 5" and contains the sentiments of fourteen of Hattie's friends. An alphabetical surname list and an alphabetical list of the signers, including any residential or personal information they gave, appear at the end of this post. Several of the signers were members of the Weston Family. Annie F. (Haynes) Weston and her husband Thomas Milton Weston of Kents Hill, Maine, signed facing pages; he dated his inscription December 19, 1886. Annie F. (Haynes/Haines) Weston was the daughter of Charles and Eliza A. (Low) Haynes. Thomas Milton Weston was the son of Simeon and Lavinia (Blanchard) Weston. 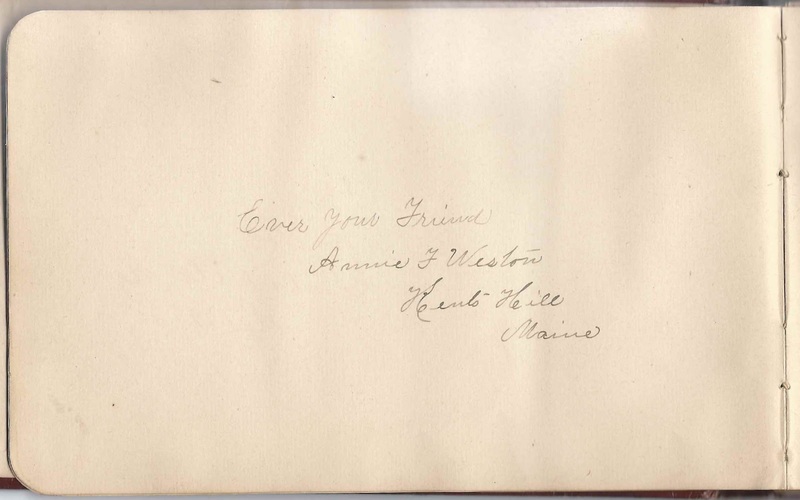 The Hattie N. Weston of Kents Hill, Maine, who signed a page on September 19, 1886, was presumably Thomas Milton Weston's sister, Harriet Newell Weston. Late in life, on December 23, 1928, she married widower Miles Everett Williams, whose first wife Ellen Susan (Joy) Williams had died earlier in the year. Another sister of Thomas Milton Weston who signed a page in the album was Mary Alice (Weston) Rhino, or Alice Mary (Weston) Rhino, first wife of Simeon Lewis Rhino. She signed her page on October 2, 1886, when she was living at Boston, Massachusetts. She later married Charles F. Taylor. 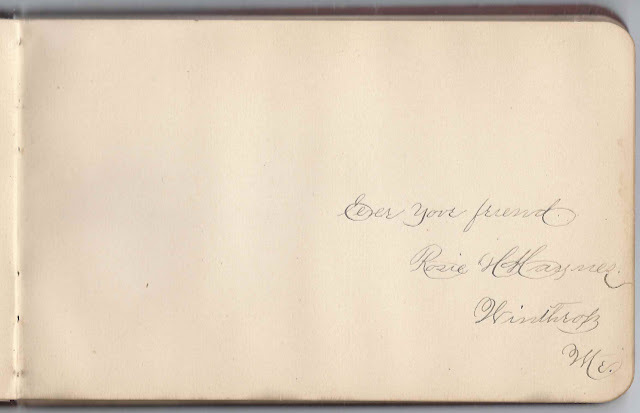 Rosie H. Haynes of Winthrop, Maine, signed a page. She was a sister of Annie F. (Haynes) Weston. 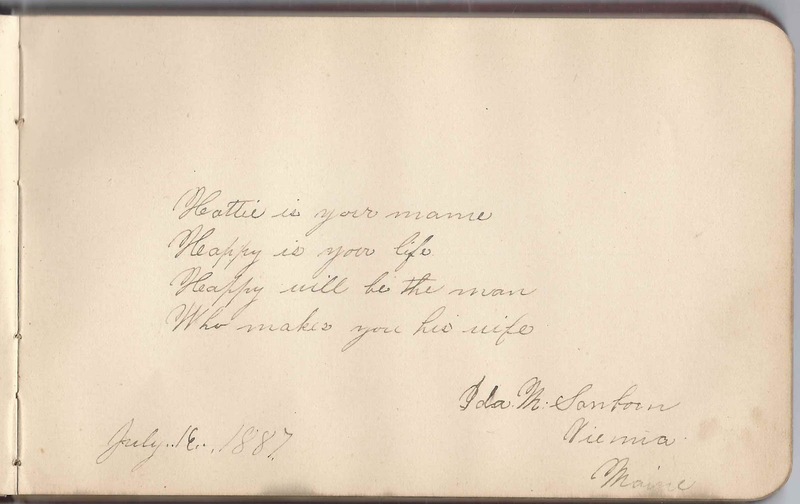 If you have a theory as to the identity of album owner Hattie, or information on any of the signers listed below, please leave a comment or contact me directly. 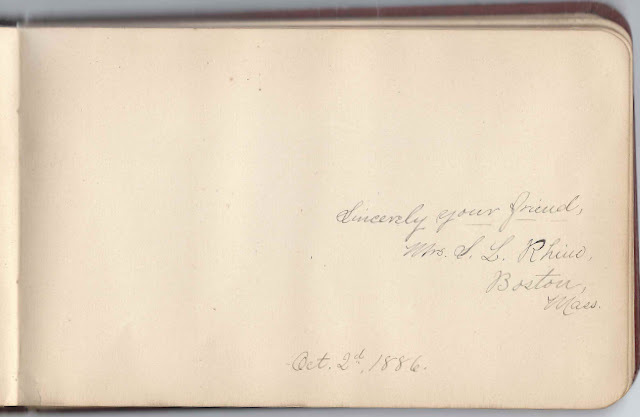 Mrs. S. L. Rhino of Boston, Massachusetts, signed on October 2, 1886. Presumably Mary Alice (Weston) Rhino (Renaud or Reynaud variation), first wife of Simeon Lewis Rhino. She was a sister of signer Thomas Milton Weston. Annie F. Weston of Kents Hill, Maine. She was Annie F. (Haynes) Weston, wife of Thomas Milton Weston, who signed the right facing page and whose sister Rosa H. Haynes signed another page. 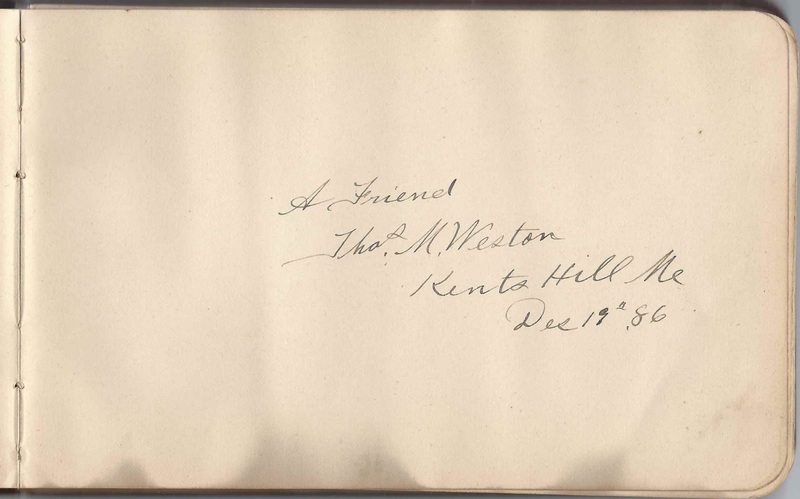 Thomas M. Weston of Kents Hill, Maine, signed on December 19, 1886. 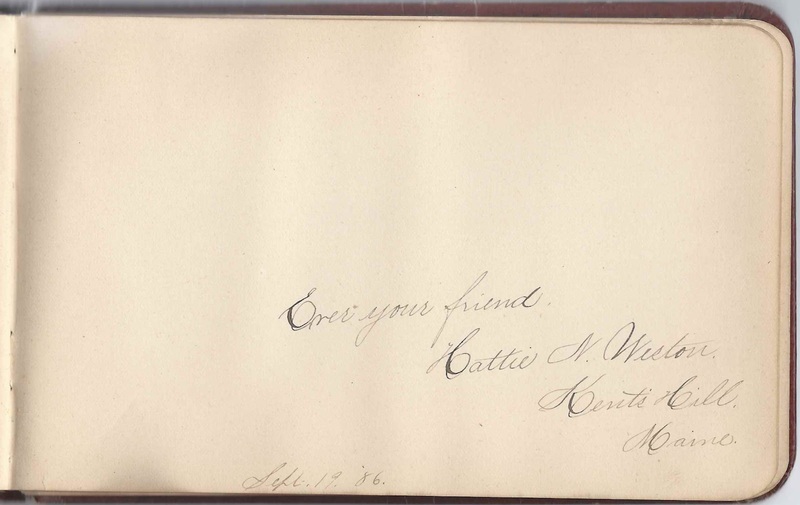 He was Thomas Milton Weston, whose wife Annie F. (Haynes) Weston signed the left facing page. Hattie N. Weston of Kents Hill, Maine, signed on September 19, 1886; presumably Harriet Newell Weston who was a sister to signers Thomas Milton Weston and Mary Alice (Weston) Rhino. Harriet married late in life, on December 23, 1928, to widower Miles Everett Williams, whose first wife, Ellen Susan (Joy) Williams had died earlier that year in May. I recognize some of the names. Have posted to our Readfield Historical Society page in case any of our followers makes a connection. This page is a great idea. Thank you!!! Thanks, Dale! Would be great to identify Hattie. I am Simeon Lewis Rhino's Great Grandson. What is the process of obtaining this item? Did you find any photos? Yes, it's available. My email address is in the right margin near the top under Inquiries. I don't have any photos, sorry. Not sure where I got this, but probably in an antique shop in Maine or perhaps on eBay. I know exactly who Hattie is. Hattie (Harriet Newell Weston was born 10 Sep 1862 in Winthrop, Maine and died in 1950 and is buried at Readfield Cemetery in Readfield. She lived in Winthrop most of her life and is my 2nd Great Aunt. Her Father was Simeon Weston and Mother Lavina Blanchard. They had 7 children and one of them was my Great Grandmother, Alice Mary Weston. Thanks for the identification - have amended the blog post with a note at the beginning. In fact, I have an original document that she witnessed by Grandfather, Harry Newell Rhino's birth that was used to get him registered for Social Security in about 1939.